Some people live in the same house all their life. Others, like me and my family, have moved a good deal. We never seem to forget the houses that we call home. I am so glad that Mom took photographs of all the houses that my brother and I grew up in. Mom, the genealogist, recently prepared a Google map showing the towns where she has lived. She could attach photographs of the houses, but I am not sure she has done that. This is a great way to show others, particularly grandchildren, where you lived. Generations ago our relatives and ancestors did not document their houses with photographs. I think it would be fun to prepare a family tree of the houses. Mom has two houses carved by a wood-artist in Pennsylvania. They are of her grandparents' log cabin and her great grandparents' house in North Carolina. The wood carvings are about 5 inches by 3 inches in size. They are painted realistically. I can remember my great grandparents' log cabin. It is still standing and in the family, though not lived in. The other house was gone long before I was born. There is also a story that Mom tells about the two little houses standing side by side on her desk. When she was about fifteen years old she discovered her Granny's love letters. They were neatly tied together with blue ribbons. Reading some of them she also discovered that her grandparents had planned on eloping. Granny's father , a minister who lived in the beautiful, white house in North Carolina, was not in favor of a marriage. He told her she would never have a nice house to live in if they married. Comparing the two houses on Mom's desk, maybe he was right. The white house was very nice. However, we all loved the log cabin. It was full of love and stories and get togethers with relatives. It definitely was home! Several years ago Mom located the Victorian house where her father lived in South Dakota. She was told that it was being demolished for a business. Mom took photographs of it from every angle. Dad tormented her that she didn't need all of those photographs. They are all that are left the house that once was my grandfather's home. 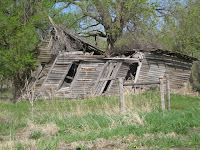 Recently Mom and Aunt Cheri discovered the falling-down house that belonged to Aunt Cheri's great great grandparents. There are holes in the wall, a sunken in roof and crumbling fire place. It is hard to imagine people living there, but I am sure it was home and they were proud of it. A house is a house, a roof over your head. A home is what you make it....love, satisfaction, along with good and bad memories.